LOWER EAST SIDE — Developers bringing three massive residential developments to the Two Bridges waterfront have rejected a demand from neighborhood representatives to allow more time for community engagement before the city kicks off its official review of the projects' anticipated impact, stating they believe it would be "counterproductive." Community leaders on Jan. 18 halted an input session meant to gather feedback on a trio of controversial towers headed to their neighborhood to demand JDS Development, Starrett Development, and Two Bridges Associates allow several more months of discussion with community members before an official scoping hearing is held and the city-mandated environmental review process begins. The developers are each planning skyscrapers within a three-block radius that locals fear will negatively impact their quality of life. JDS plans to build a 77-story tower at 247 Cherry St., while Two Bridges Associates plans two towers on a shared base at 260 South St. Starrett is planning a 62-story residence at 259 Clinton St. The hearing before the city's Department of City Planning, where the public can offer feedback on a draft of areas of concern to be evaluated through the environmental review process, is currently slated for April. Community leaders, however, said it should be pushed back to at least September to allow enough time for a meaningful community engagement period before the official process kicks off, since the scale of the projects is so large and residents have concerns that have not been adequately addressed. The January input session culminated in a mass walkout of angry residents when the developers did not immediately provide an answer to the demand. A lawyer for all three developers pledged a response within a week. More than two weeks later, the developers released a joint statement rejecting the demand, arguing that pushing back the start of the official review process would be "counterproductive." After the draft scope is evaluated at the hearing, a final scope will be released, giving residents more definitive answers to their questions and allowing them to provide further feedback, said the developers. "Moving the Scoping Meeting to September will only delay the ability of community residents to access and review the kind of detailed information that they have asked for in order to evaluate the projects," the joint statement said. The statement also notes that the series of input sessions being held before the scoping hearing, which are "not required by law or regulation," are part of an "unprecedented" effort to gather feedback from locals in addition to the public hearings required by the city. Locals will have additional opportunities to provide feedback throughout the environmental review process, and will be able to respond to a draft of the Environmental Impact Statement that will be produced through the process before it is finalized, according to the statement. Representatives for residents of buildings in the area — Lands End I, Lands End II, Two Bridges Tower and 286 South St. — said they are "very disappointed" by the rejection and disagree that a delay in the timeline would be counterproductive. The "detailed information" the developers say will be provided once the process kicks off could be addressed now if the developers were willing, the reps said. "There is nothing stopping developers from being specific about what affordable means, yet in two community engagement meetings they’ve failed to be specific. 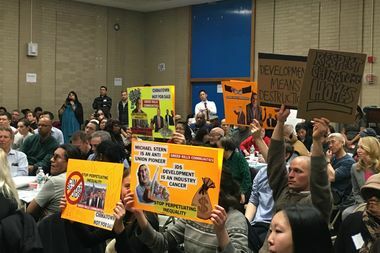 There has been no real effort to address the issues raised by residents in the Two Bridges community who are adamantly opposed to these developments citing, gentrification, overcrowded subway stations, already scarce parking, excessive building heights, neighborhood character, displacement of senior citizens, etc.," their joint statement said. The reps further stated that the additional time would allow concerned locals to discuss and better understand the massive projects headed for their backyard. "We frankly disagree that it would be counterproductive to delay as this position presumes that the only discussions regarding these developments and their potential impacts would only need to involve direct engagement with the developers and their agents; we frankly need this additional time to discuss impacts within the community and with our representatives." The next public input session will be held on March 4 from 10 a.m. to 2 p.m. at the Manny Cantor Center at 197 East Broadway. There will be a fourth meeting sometime after the April scoping hearing. In the meantime, the developers have provided answers to questions they have gathered at past input sessions on their website.